TC Electronic DITTO Review– based on Question/Answer format so you can skip around to what you care about. Feel free to post questions or answers below the review. Target Setup: jamming, learning, video performance. Due to it’s small form factor, the DITTO is great for addition to a pedal board. Interesting to note, it is mainly designed for guitar and base players. In the DITTO manual it is noted that this is not a product designed for singers, drummers, DJ’s, or experimental Jazz xylophone players. Also, if you want a looper that can be a platform for brainstorming compositions, this isn’t a good option as there is no long-term memory storage for more than just the current loop. Competitive Position: Take a look at the detailed comparison of the TC Ditto and the other compact (micro) loopers that have been released. It can be found here. Warranty: standard 1 year warranty through TC. However, if registered online within 90 days it increases to 3 years. See details. 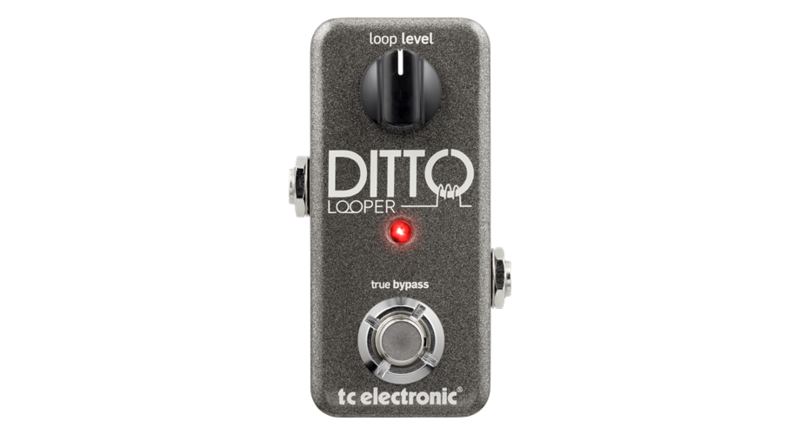 What is the price I should expect to pay for the TC Electronic DITTO and how does that compare to other loopers? Please see our price tracker that we update regularly. Here, the various looper stations are categorized and the price is tracked over time as indicated. Also, keep in mind you will need to buy a separate 9V power supply, because they oddly do not include one with the DITTO. Those run about $8-$10. What is the main function of the TC Electronic DITTO? The only function of the TC DITTO is looping. Everything else has been stripped out. There are no effects or presets. There is no ability to save loops for long term or save them onto your PC (the Mini-B USB connector is only to update firmware). Can I record sound, continuously play a loop of that recording, and then layer additional tracks over the loop/phrase with the TC Electronic DITTO? 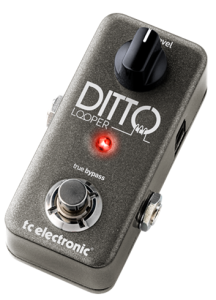 Yes, the TC DITTO has basic looper functionality with unlimited overdub, controlled with a single footswitch button. The process is to start recording, then to begin looping what you have recorded, then to add your additional layer. You can continue to add layers or to stop the playback. How long can I record with the TC Electronic DITTO? The TC DITTO can record 5 minutes. How many memory locations (slots) are included in the TC Electronic DITTO? There is only one memory slot. Using the TC Electronic DITTO, can I learn by having an instrument teacher play something and then slow it down and work on matching the notes and gradually speeding up? No the TC DITTO does not have any tempo control/adjust. Can I practice soloing with the TC Electronic DITTO? Yes, this is really one of the main uses of the DITTO. It is designed for many different types of guitars listed on The Sound Junky. Can I use the TC Electronic DITTO to capture quick song ideas to review later? Only for the single memory slot that it has. Therefore, it’s not ideal for this use. Can I switch to a different loop/slot while performing with the TC Electronic DITTO? No, there is only one loop/slot to work with on the DITTO. Can I perform loop-to-loop queuing with the TC Electronic DITTO? Can I switch back to the previous loop while performing with the TC Electronic DITTO? With the TC Electronic DITTO, can I record and play different parts of a song (verse, chorus, bridge) all during a live performance while not using my hands (pedals and footswitches only)? Can I go from recording directly into overdub with the TC Electronic DITTO? No, the progression of events with the DITTO is record à playback à overdub. If you double tap to try and speed that process up, it will stop. Can I undo/redo the last overdub to change the song or eliminate a recording error with the TC Electronic DITTO? Yes. With the TC DITTO, you are able to undo the last overdub and also redo the last undo. Can I set previous layers to go quieter or fade out while overdubbing new layers with the TC Electronic DITTO? No, this is considered an advanced function that is only available on more expensive and complicated loop pedals. Can I adjust the volume or effects of individual overdubs with the TC Electronic DITTO? No, there is only one volume knob on the TC DITTO and it controls the level of loop volume. Can I record individual overdubs/layers as individual WAV files with the TC Electronic DITTO to then work with in a DAW? With the TC DITTO, we are not aware of any method for individually recording overdubs/layers. Can I use the 1/8” MP3/CD input to play song into the looper and incorporate it into my loop with the TC Electronic DITTO? There is not a 1/8” input on the DITTO, but you could accomplish this by using a 1/8” to 1/4” adapter with the input. Can I pre-record tracks, edit them in a DAW, load them into the TC DITTO as loops and then trigger them with the footswitch when needed? No the USB Mini-B connection on the DITTO is only there for firmware updates. Can I trigger a one-shot playback (a.k.a. single phrase) with the TC Electronic DITTO? In other words, can I set the loop to only play one time when triggered? No there is no one-shot playback feature on the DITTO. Can I play multiple loops simultaneously with the TC Electronic DITTO, and turn them on and off? For example, play drums on one track, base-line on the other, and guitar on another and bring them in and out of the song? The only way you could partially accomplish this with the TC DITTO is with the undo redo functionality, and it would be very limited. Can I play a loop or overdub in reverse with the TC Electronic DITTO? No, the TC DITTO does not have reverse. Does the TC Electronic DITTO have stereo sound or just mono? The TC DITTO has mono sound. Is there anything in the TC Electronic DITTO that reduces the clicking sound that can occur when tapping the footswitch during overdub? Not that we are aware of, but because this is geared towards guitar/bass it’s not likely that you would pick up the clicking sound of the footswitch unless you’re using a mic to capture the instrument sound. Is the TC Electronic DITTO a good looper for live performances on stage? In my opinion a looper performance with only one track is not ideal. I would suggest that you get a pedal with multiple tracks (like the Boomerang III, Pigtronix Infinity, RC-3oo, RC-505, etc) if you are performing live. This allows the creation of verse-chorus-bridge song constructs. Are there multiple stop modes in the TC Electronic DITTO? No, there is only one stop mode for the DITTO – immediate. Can I stutter start with the TC Electronic DITTO? No, there is no known way to accomplish stutter start with a DITTO. Can I resample with the TC Electronic DITTO? In other words, can I take a loop and modify it by multiplying it, cutting part of it out, adding a different effect to it, etc? We are not aware of any resampling or multiply functionality with the TC DITTO. Can the TC Electronic DITTO be set to auto-record when I begin playing? No the TC DITTO does not have auto-record. With the TC Electronic DITTO, are there any issues with droning (playing the same note, chord, repeated sounds, or tone-clusters continuously) at the boundaries of the loops – such as noticeable change in volume? We have not experienced or heard of an issue with droning using the TC DITTO. Does the TC Electronic DITTO have a built in metronome? There is no built-in metronome for the TC DITTO. Is there any software that comes with the TC Electronic DITTO? No, there is no software package that comes along with the DITTO. Is quantize functionality available on the TC Electronic DITTO? No, there is no quantize function on the DITTO. Will the TC Electronic DITTO interface with my DAW (digital audio workstation)/computer through USB? The TC DITTO does not function as an audio interface. The USB is only used to update the firmware. Will the TC Electronic DITTO interface with my computer through USB to transfer sound files? No, the USB is only used to update the firmware. Can I save and recall loops with SD card with the TC Electronic DITTO? The current loop you are recording is saved through power down and is still saved when the unit is powered up. However, there is no removable card and there is only one memory slot. Does the TC Electronic DITTO have effects (FX)? No the TC DITTO does not have built-in effects (FX). Can I bypass the effects (FX) with the TC Electronic DITTO? No, this is not applicable to the TC DITTO because the unit does not have internal effects. Can I turn off or mute the live signal that is fed through the TC Electronic DITTO (for use in parallel effects loops of an amp or in Aux Send/Return of a mixer)? No, but on a somewhat related topic, the Ditto has “True Bypass”. It will automatically go into this mode where the AC/DC/AC is completely by-passed when you are not looping so that the DITTO X2 can be part of an effects chain. Can I save presets for effects with the TC Electronic DITTO? Does the TC Electronic DITTO have an XLR mic input? Does it have phantom power for a condenser microphone? No, the TC DITTO has a single mono 1/4” input. Does the TC Electronic DITTO function as a mixer with multiple inputs? No, the DITTO only has one input. Can I re-assign footswitch functionality with the TC Electronic DITTO? There is only one footswitch on the DITTO and it has multiple functions – record, play, overdub, undo, redo, stop, and erase. Does the TC Electronic DITTO have a headphone jack for playback and monitoring? No the TC DITTO does not have a dedicated 1/8” jack for headphones. Can the TC Electronic DITTO be connected to an external MIDI device? No the TC DITTO does not have MIDI ports. Does TC Electronic release firmware updates for the TC DITTO? Yes they do. That is the sole function of the USB port. Is there an optional footswitch that I can add to the TC Electronic DITTO to increase functionality? No, there is no added or off-loaded functionality that can be added with an external footswitch for the DITTO. Is there an optional expressional pedal that I can add to the TC Electronic DITTO to control effects(FX)? No, there is not a way to connect an expression pedal to the TC DITTO. For the TC DITTO, the A/D/A conversion is specified as 24-bit, 44.1 kHz. Can the TC Electronic DITTO be battery powered? No there are no battery options for the TC Electronic DITTO. I do think it would be possible to connect a 9V battery by utilizing a 9V battery clip to barrel jack adapter . Note that you would need to find a version with a center-negative barrel jack, or re-wire the one in that link. According to the TC knowledge base, the max current draw of the DITTO is 90mA. So, a 500mA-hour battery could keep it running for five and a half hours. This battery operation is not described anywhere on the TC website and we haven’t tried it, so try at your own risk if battery operation is needed for a specific pedal board or venue. What size is the TC Electronic DITTO? The TC DITTO is very compact. It’s footprint is 1.9” x 3.7” and is 1.9” tall. However, keep in mind you must connect an external DC power supply (9V), which can actually be larger than the looper. Why is using a TC Electronic DITTO better than just using computer software? Or why should I use a stompbox looper instead of something that is software based? Why is using a TC Electronic DITTO better than just using an iPhone or iPad application? There is very limited functionality with the iOS based loopers compared to the TC Electronic DITTO. However, these apps are quickly improving. With added hardware (microphone, Bluetooth control pedal, etc. ), these setups may start to look attractive. Please see our iOS app setup information. What company makes the DITTO and where are they located? TC Electronic is located in Risskov, Denmark. The company was founded in 1976. How is the support from TC on any issues that arise with the unit? 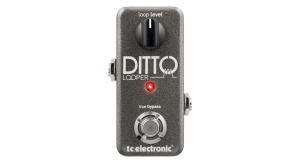 The DITTO is a very simple looper, but TC has video’s, a good manual, a support forum, a knowledge base, an active Facebook page, and provides firmware updates. The only issue here is a potential scattering of support venues that could lead to them neglecting some of them (like the forum). However, I wouldn’t be concerned with support in general. How long has the TC Electronic DITTO been in production? The TC DITTO was first announced at NAMM 2013 in January 2013, and started to ship that March.